MSC Software Corporation, the leader in multidiscipline simulation solutions that accelerate product innovation, announced the new release of MSC Nastran 2013.1, augmenting the groundbreaking capabilities like solver embedded fatigue, optimization for fatigue life and poroelastic material modeling introduced in the previous 2013 release. The new capabilities in 2013.1 provide engineers with faster performance for large models, ease of use, and nonlinear analysis improvements. 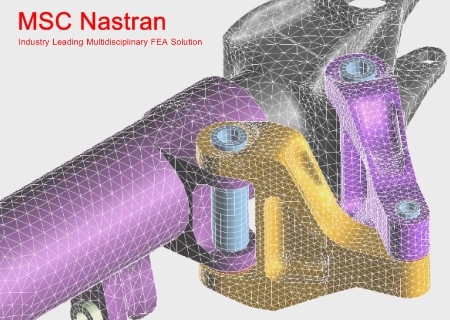 Automated Component Mode Synthesis (ACMS) in MSC Nastran has shown performance improvements over the past several releases to enable users to perform modal analysis of large models. The new release delivers further speed enhancements with 10% to 30% time reductions in the ACMS portion of large scale simulations reducing the time and cost of modal and automotive NVH simulations. In particular, overall run times dominated by I/O are mostly impacted. Gas turbine and aircraft engine manufacturers can achieve more accurate prediction of the rotordynamic performance of structures with rotating components with the help of the new axisymmetric harmonic elements. Users can model geometrically axisymmetric structures subjected to general non-axisymmetric loading represented by harmonics, allowing engineers to capture the effects of the complex geometry of the rotors, achieving better results. Improved integration has been achieved between MSC Nastran 2013 and SimXpert 2013 so very large models can be visualized. The nonlinear analysis capabilities have been further improved to provide increased ease of use and flexibility to handle large models with efficiency. - Contact Improvements: The contact table that provides flexibility in defining contact interactions between multiple components has been reorganized to make it more readable, and requiring less user input, which is highly beneficial when modeling large assemblies typical to automotive and aerospace industries. - Linear perturbation steps like modal analysis, direct frequency, modal frequency, modal transient, direct complex-eigenvalue and modal complex eigenvalue analyses that follow nonlinear static or dynamic steps, require the element stiffness and mass matrices formed at the end of the nonlinear loading steps. The improved capability in the current release enables users to take advantage of the fidelity provided by the advanced elements of the nonlinear solution sequence. - Micromechanical composite material models are now achievable utilizing the e-Xstream Digimat technology within SOL 400 and SOL 700. This provides greater accuracy to the simulation. - Thermal stress analysis: Temperature mapping of multi-degrees of freedom heat transfer shell elements is enhanced, providing more accurate temperature distribution, in turn resulting in higher fidelity stress results in sequential thermal-mechanical analysis. - The User Defined Subroutine capability of MSC Nastran has been made much more user friendly reducing the overhead work needed, and providing the flexibility required for advanced analyses that could involve proprietary element formulations, custom material property formulations, application of specific rules to a contact problems, or integration of CFD applications. New material models, namely Johnson-Cook model for damage criteria, and Gurson model to describe the plastic flow, have been implemented for explicit analysis, providing improved accuracy related to damage and failure of materials. Newly implemented user subroutine support also helps users customize the model with user-defined material models, flow boundary conditions, friction models etc. for improved simulations. Other enhancements include Arbitrary Beam Cross Section (ABCS) enhancements to enable users to model unique beam cross sections, and monitor point enhancements to extract specific information from the analysis.